Home / Home of The Decopatch Place - All the ranges, all in one place! / What is it & How to do it? What is it & How to do it? So you might be wondering what is Decoupage? and how you do it yourself? Well not too worry we are here to help! But don’t worry we now have a much easier and effective way of decoupaging! We say ANYONE can do it, whether your 3 or 103! The amazing thing is Decoupage works on any and all type of surface’s you can think of (Glass, metal, wood, stone, plastic) the possibilities are endless- We like to call it ‘Jazz up your Junk’ because not only can you cover paper mache items and animals that we sell, but also you can take a trip down to the charity shop, or ikea- or even just into your garage, find something that’s old and needs a new lease of life and transform it with Decoupage! Once you get started there will be no stopping you- Please have a look at our gallery to see what other people have created! – But BEWARE.. its addictive! What’s the difference between Decopatch & Decoupage? It is important though that you do use the specially made Decoupaging paper, nothing works anywhere like this paper, its super thin, flexible but also hard wearing, and its important you use a glue which contains a varnish, this means you dont have to varnish any of your items once your done, because the glue already does that for you! 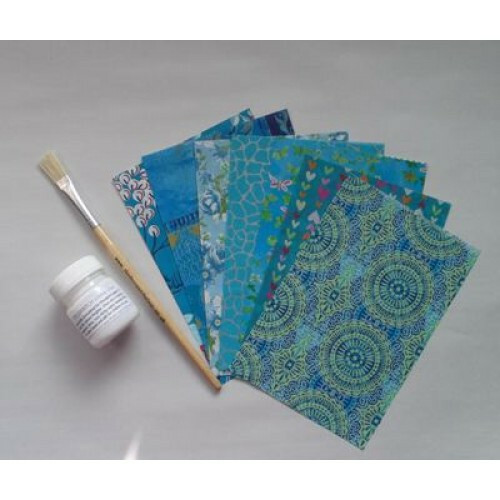 Selection of decopatch or decoupage papers. How to Decoupage? What is Decoupage? 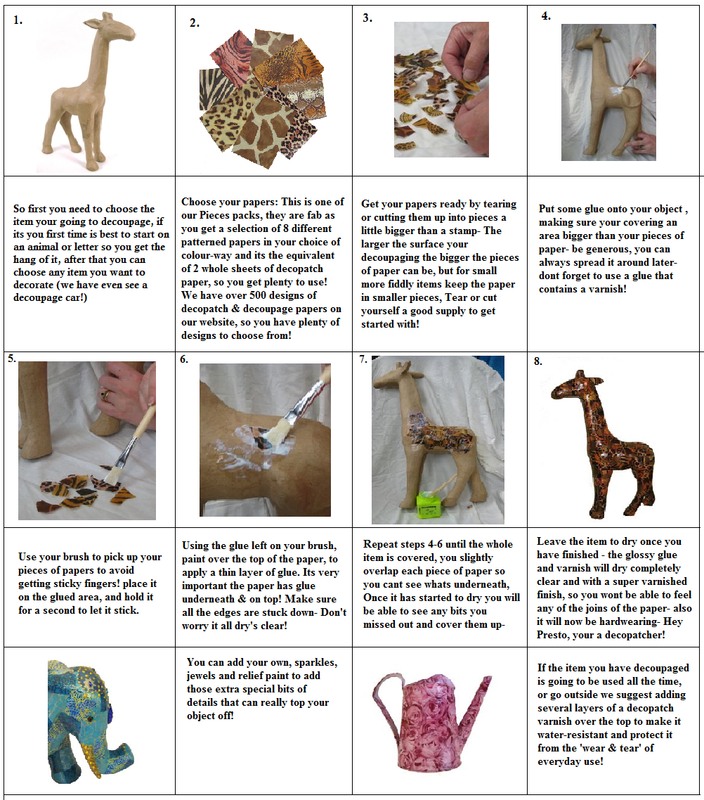 A fantastic way to start your venture into the decoupage world is it purchase any item you want, in a complete kit- This means it will come with a full list of instructions, the item, plenty of glue ,paper & a brush! Everything you need to get started, or our kits make amazing presents! Also starter kits are a good way to start if you already have something at home you can decorate! Please email or give us a call if you would like any help or more information!